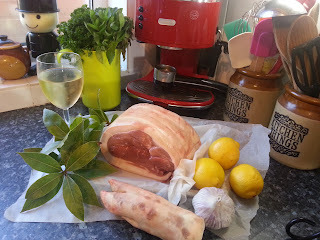 A simple roast tonight, just a lovely piece of pork shoulder, some baked potatoes and one vegetable; some sprightly-looking spring greens that I couldn't resist when I was out shopping..
Take a whole head of garlic, the cloves separated but unpeeled, two or three lemons, quartered, and 3 shallots, skins left on and halved. Add to this several fresh bay leaves and, if you can, a pig's trotter, split. I get these easily from my butcher, and they cost next to nothing (and often actually nothing). 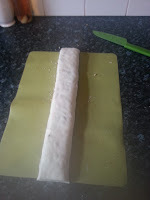 Rest the pork on top, I unrolled the joint to allow for quicker cooking and maximum output of crackling. Pour over a little oil, then sprinkle with crumbled dried bay leaves (I dry the leaves from our bay tree in the microwave, giving them 30-second bursts until dry and crunchy) and a good grinding of white pepper. Obviously the cooking time will vary based on the size of your joint; I work on 20 minutes per pound (or 450g, if you prefer) in a hot oven. Pouring a glass of white wine over the pork after about 20 minutes and later still adding 350ml, give or take, of stock (I used pork stock, but chicken would be fine too, as well as fine crackling (the secret to which, strange as it seems, is regular basting with the juices from the roasting tin) it produced an easy gravy that was not as thick and meaty as some, but aromatic and flavoursome with a kick of sharpness from the lemon. 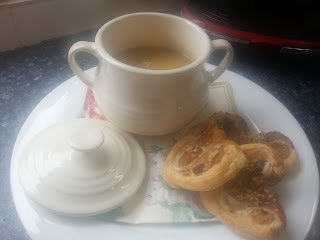 Hubby wasn't as keen on this as he is on my more usual thicker and 'meatier' gravies, but the children and I adored it. When the pork is cooked and resting, strain the juices into a saucepan. Add a splash of boiling water to the roasting pan and, with a wooden spoon, scrape up the 'burny'- looking tasty bits from the bottom. Strain this liquid into the pan too, then cover and boil hard for a few minutes to emulsify the gravy. Season to taste and pour into a warmed jug. 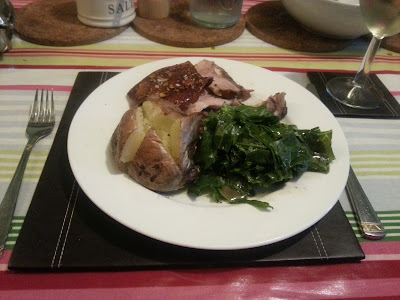 Serve the pork, sliced, with shards of crackling, baked potatoes and simple steamed greens. Perfect. Today we're having a lazy, chilled-out day; the children have a birthday party to go to later on and my lovely, lovely Husband has relieved me of the need to take them, meaning that I will - for once - get a bit of actual weekend time to myself, and at home to boot! 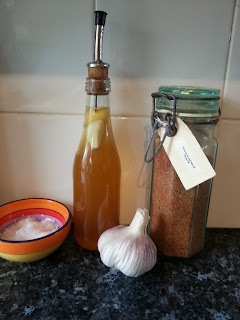 This morning I've done only a very little kitchen pottering, mainly making the boys' lunch - baked sweet potatoes with cream cheese and pesto filling - but also refreshing my bottle of garlic vinegar and making up a fresh batch of seasoned salt, which I use often. It started out as 'chicken seasoning' (and is, still, superlative scattered over chicken before roasting), but since finding more and more uses for it (not least scattering over potatoes before baking, whether whole or cut up), I've taken to calling it seasoned salt, though in reality it's more like salty spice-and-herb-mix. That hardly trips off the tongue though, does it? Mix everything together. I tend to give it all a good whirl in the processor, to eliminate any streaks of salt. Bung it in a jar. Use liberally and often. Last night, for supper, I grilled a stack of lamb leg steaks and made a couple of different salads to go with. In the interests of gilding the lily, I also toasted some pitta and knocked up a batch of this gorgeous avocado houmous. Smooth and mildly nutty-tasting, this knocks guacamole out of the park as far as I'm concerned, and is A.Mazing with lamb. It also has the huge advantage of staying perfectly green for days, rather than mere minutes, so can be handily stashed in the 'fridge for hungry moments (or, quite frankly, for those standing-by-the-open-'fridge-with-a-spoon moments!). Cooking the already-cooked, tinned chickpeas for a few more minutes makes for a desirably smooth houmous, plus you can fish out as many of the papery skins as possible (they seem to detach easily when cooked) for an even better texture. Put the drained, rinsed chickpeas into a saucepan and cover with water. Bring to the boil and cook for 3 minutes, or until very soft. Scoop out as many of the skins as you can or want to. Drain and allow them to steam dry for a few minutes. 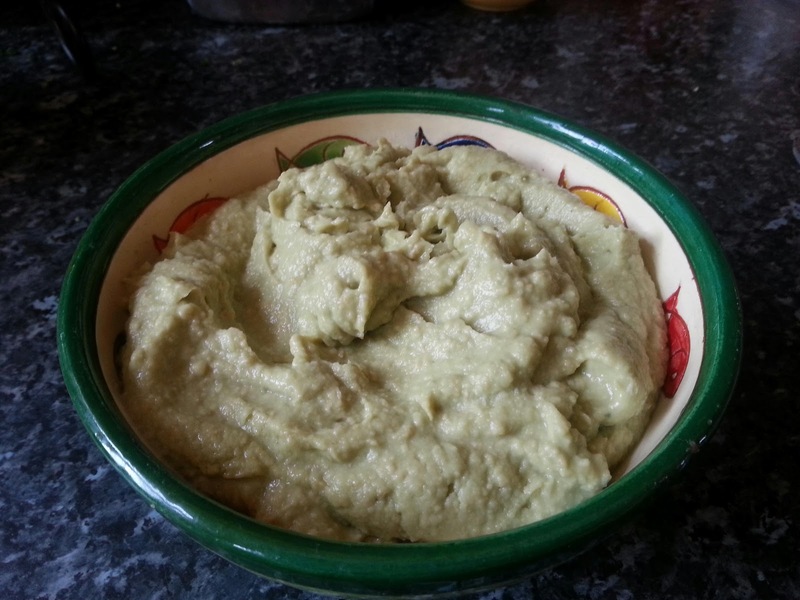 Put everything, bar the oil (and you can use a different mild oil if you want, I just always use avocado oil here) into the processor and whizz to a smooth and creamy looking paste. Drizzle in oil to achieve the texture that you want, I prefer my houmous to be on the softer side, rather than standing up in stiff peaks. Serve immediately, or seal in a tub in the 'fridge for later. Another lovely sunny day here today, so a light lunch was called for, in order to allow for maximum time spent in the garden and minimum time spent actually having to do anything. 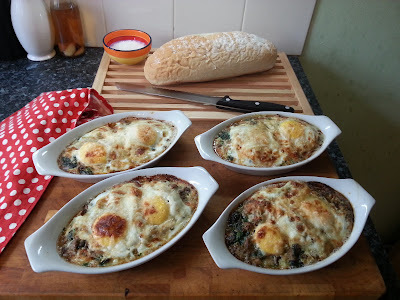 Baked eggs are, anyway, a bit of a weekend lunchtime favourite at Distracted Towers and this is a lovely version. 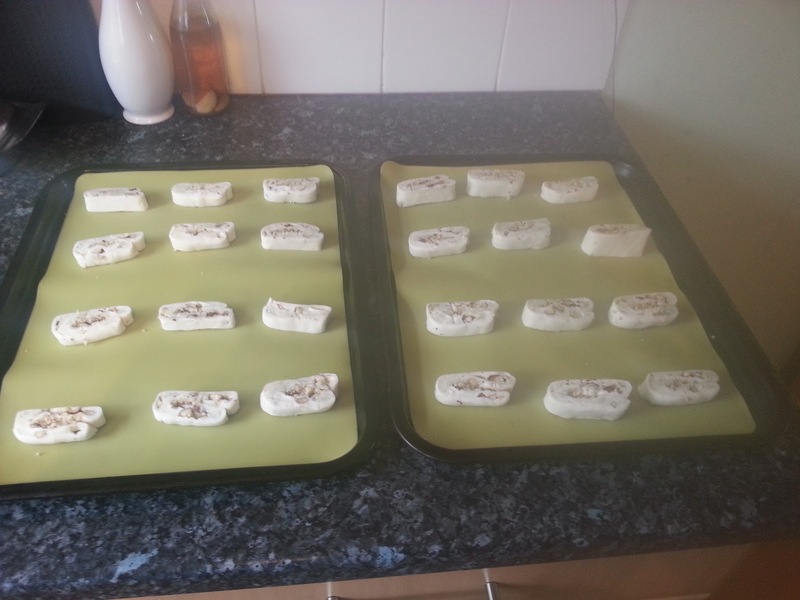 Preheat the oven to 180ºc. Melt the butter and fry the mushrooms over a high heat. I have some rather wonderful porcini mushroom powder called, endearingly, Shake O'Cini, and I added a few shakes here to boost the mushroom flavour, but you don't have to be as elaborately specialist if you don't want to be..! 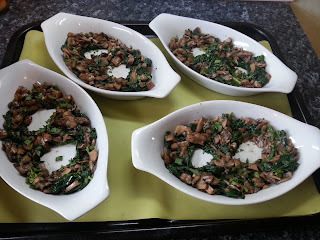 When the mushrooms are brown and almost 'squeaking' as you stir them, pack the spinach into the pan and put on the lid. Remove from the heat and leave for a few minutes. Remove the lid, stir well and then replace the lid for a few minutes more until the spinach is well wilted. Tip the vegetable mixture into a sieve over a bowl, and press down on it with a spoon, allowing the scant, but flavoursome, juices to drain through the sieve. Stir the cream into the strained juice. You can just as easily use double cream instead, but whipping cream is what I mostly have in the 'fridge. Arrange the vegetable mixture in shallow ovenproof dishes and make a 'hole' for each egg, as shown in the picture, left, and scatter over the chopped tarragon, if using. Tarragon is a great addition to the triumvirate of mushroom, spinach and egg, but leave it out if you don't have it, or don't fancy it. There's no mileage in using dried tarragon here... Put the dishes onto a baking tray (I lined mine with one of my silicon mats to provide a non-slip surface, stopping the dishes from sliding around on their short journey to the oven. Crack each egg into one of the 'holes'. Drizzle over the cream-swirled cooking juices, then scatter over some parmesan. Bake for 10-12 minutes, then remove from the oven. The eggs will continue to cook in the dishes, so err on the side of their being slightly underdone when you take them out of the oven, rather than risk overcooking them. Serve with a nice loaf of bread and some crunchy salt to sprinkle over the eggs. 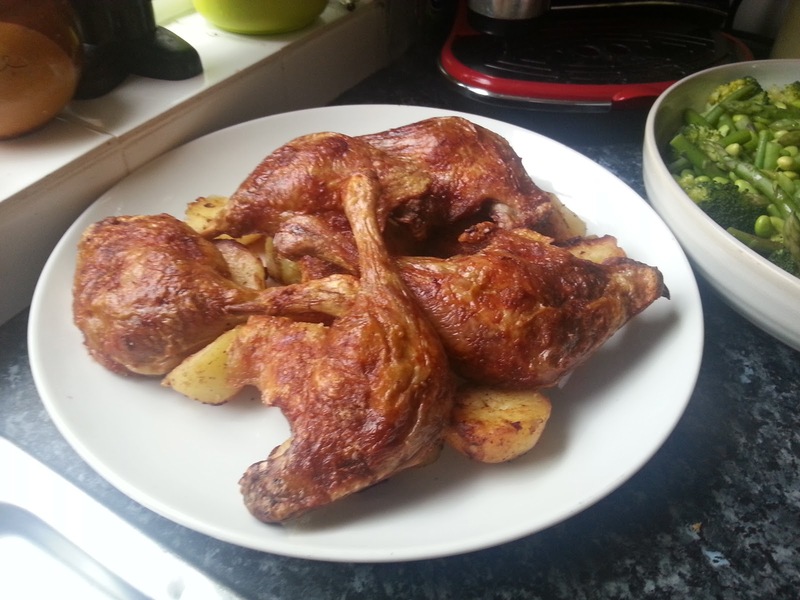 For a truly fabulous accompaniment to the duck and potatoes, try this brilliant green vegetable medley, that I have shamelessly pinched from my Mum; the best cook I know, and the undisputed maker of the world's best roast potatoes and gooseberry mousse. 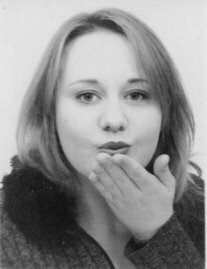 Love you, Mummy! 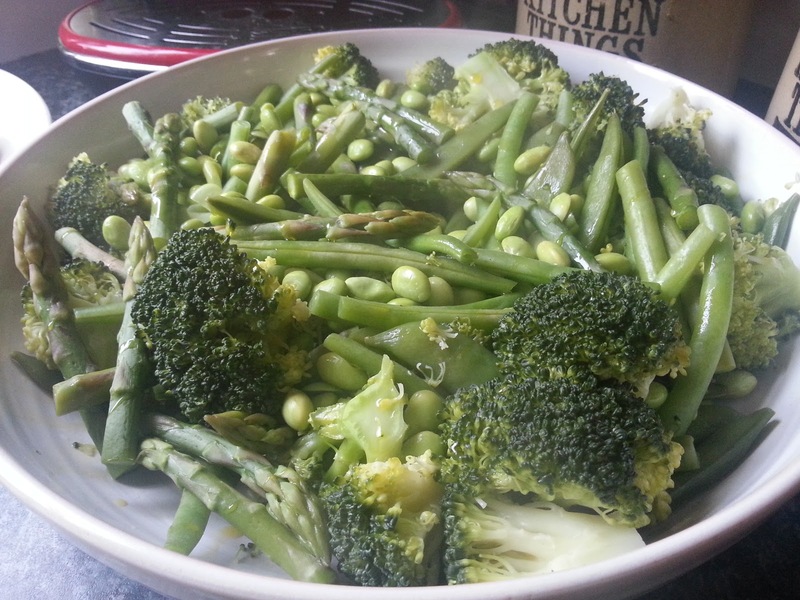 Cook handfuls of fine green beans, broccoli florets, chopped asparagus, sugar snap peas and (frozen) soybeans until each is tender. Serve combined in a large dish. I, personally, like to swish over some cold-pressed rapeseed oil just before serving and add a smattering of Maldon salt, for crunch and savour. This medley makes for a fabulous lunch the following day if you eschew any leftover cooked broccoli (add it to the soup box) and crumble over some feta and, perhaps, a few toasted walnuts. Nommy weekend treats! 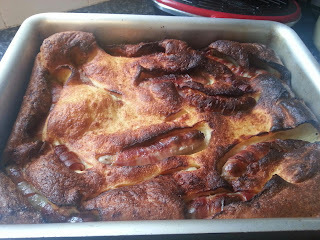 Tonight we ate Toad-in-the-Hole for supper, with gravy and a buttery mound of sweetcorn. 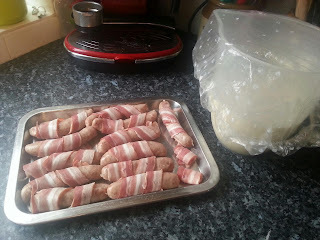 The toad was hugely boosted by the presence of a pack of pancetta languishing in the 'fridge, the slices just waiting, begging, to be wrapped around the chipolatas before they started their toad-ly journey... Pop the sausages in a roasting tin with some lard or dripping, heat until sizzling and then pour over a simple batter; a pint of milk beaten with two eggs, then mixed with 200g of plain flour and a good pinch of salt. 40 minutes in a hot oven and clean plates all round! The weekend has been very half-and-half here. Yesterday (unlike today, grr!) the weather was glorious and we spent all morning and a large chunk of the afternoon in the garden. 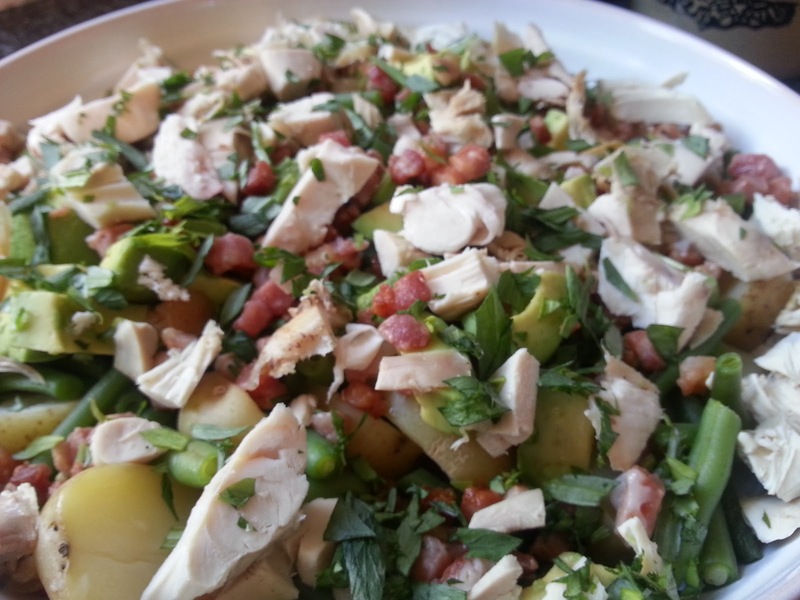 I eschewed the chicken pie that I'd planned to make for lunch and instead served up a huge bowl of chicken salad with bacon, avocado, green beans and new potatoes. Scattered with tarragon and dressed with my all-purpose honey mustard dressing, it was a hit with everyone present and much lighter eating than pie would have been on a warm day. Melt butter in a large pan, fry the pancetta for a few minutes to let the fat begin to run, then turn the prepared leeks in the juices until well coated. Add the potatoes, mixing in well, then pour in the stock, add the bay leaves and bring to the boil. Cover and simmer for 30 minutes, until the vegetables are really soft. Remove the bay leaves and purée. I use my BAMIX with the 'C' blade, but use what you like. Season with white pepper only (the pancetta is, I feel, quite salty enough). 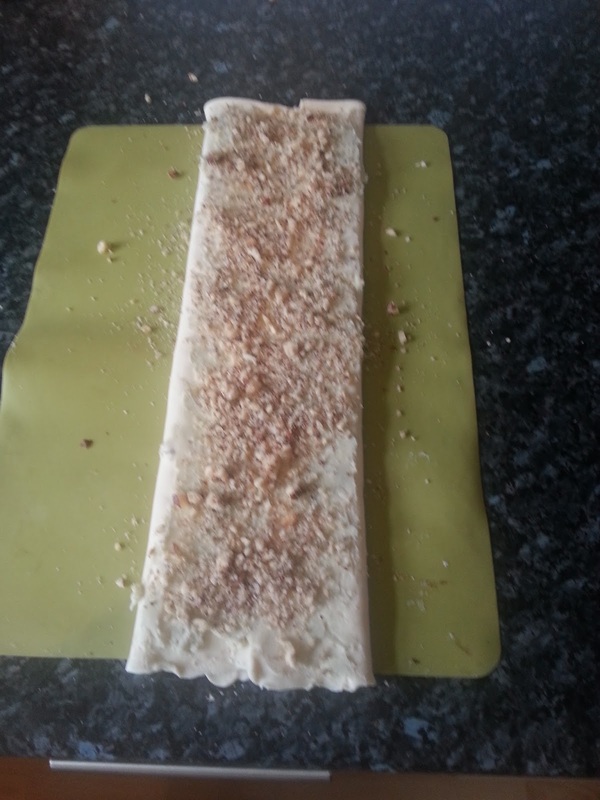 Mix the crumbled cheese and the butter together, mashing and stirring to form some semblance of a paste. 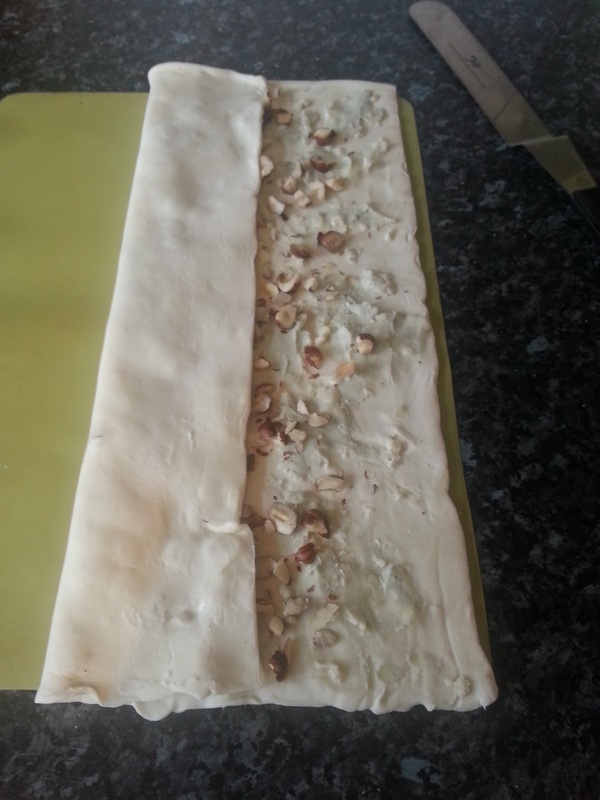 Using three-quarters of the cheese mix, dot teaspoons of this across the whole sheet of pastry, spreading it out as best you can , then scatter over the roughly chopped nuts. Fold the long edges of pastry into the centre. Now spread the remaining cheese over the uppermost surface and sprinkle with the finely chopped nuts. 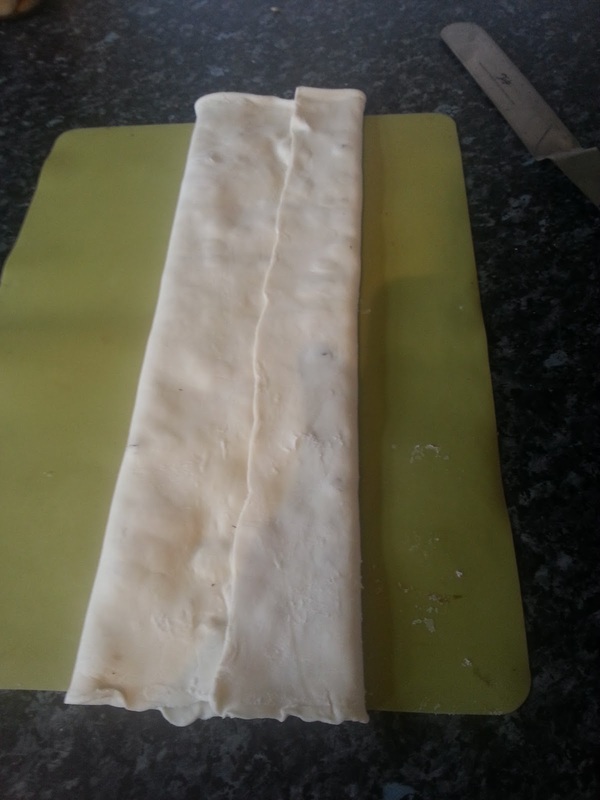 Fold the entire sheet in half (I use my silicone pastry mat to help), then wrap it up and chill it for at least an hour to firm up. When it's had a good rest, cut the log, with a very sharp knife, into half-centimetre slices. Put these, well-spaced and as shown, onto a lined baking sheet (parchment is absolutely fine and dandy if you don't have silicone mats) and bake for 25-30 minutes at 180ºc until golden, crisp and toasty. 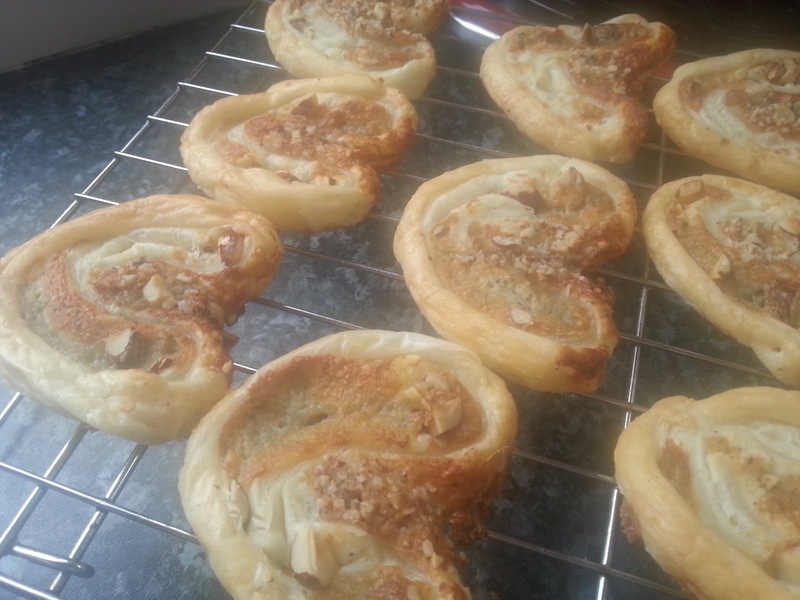 Remove the palmiers to a cooling rack as quickly as you can. 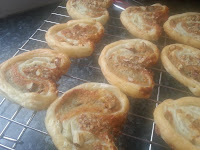 These are good either warm or cold; they are fabulous to go with drinks before dinner and keep for a few days in a tin (or they would, if my lot weren't so flaming greedy..!). 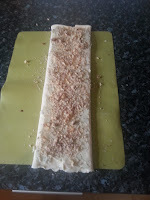 You can also prepare the logs, slice them and freeze the slices to cook from frozen. Just allow a little extra cooking time.